"I could not have been more impressed with the service and quality of the merchandise. Delivery was faster than expected." Our standard shipping is FREE. We ship via USPS, FedEx or UPS depending on the location. CoffeeCakes.com is a Colorado corporation. *See details below. Some restrictions do apply. Your most cost-effective option. This option provides door-to-door delivery of your order usually within 1 to 5 business days (Monday - Friday), depending on distance traveled. Orders usually leave CoffeeCakes.com the business day after the order is received. We don't ship on weekends. Please refer to the map below for the expected delivery time for your destination. Typically we require two days handling time. Orders are processed the next business day and typically ship the day after they are processed. So, if your order is placed on Saturday or Sunday your order is processed on Monday and then typically ships on Tuesday. We're charged an additional offshore fee to ship to Alaska and Hawaii. This fee is in addition to the standard shipping charge. Shipments to Alaska and Hawaii typically take three (3) to seven (7) business days. We currently ship to US Territories (American Samoa, Canal Zone, Guam, Mariana Islands, Puerto Rico and the Virgin Islands). We only allow standard shipping to US Territories. We're charged an additional fee to ship to US Territories. This fee is in addition to the standard shipping charge. Shipments to US Territories typically take five (5) to fifteen (15) business days. 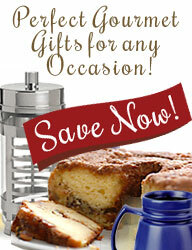 We're happy to be able to offer our gourmet gifts for shipping to Canadian addresses! Shipping to Canada requires an additional fee, in addition to the standard shipping charge, and will take about six (6) to ten (10) business days. If you have any questions about shipping your order to Canada, please send your question to info@CoffeeCakes.com and we'll do our best to answer it for you! We currently ship to Canada, Australia, Belgium, Brazil, Denmark, Finland, France, France, Japan, Metropolitan, Germany, Hong Kong, Iceland, India, Ireland, Italy, Mexico, Netherlands, New Zealand, Norway, Puerto Rico, South Africa, Spain, Switzerland, Taiwan, United Kingdom, US Minor Outlying Islands, Virgin Islands (British), Virgin Islands (U.S.). Please email "Shipping@CoffeeCakes.com" for a quote. Due to the high risk of fraud, we don't currently ship to Brazil, Italy, Mexico, Ukraine, Indonesia, Yugoslavia, Lithuania, Egypt, Romania, Bulgaria, Turkey, Russia, Pakistan, Malaysia, or Israel. Please note:Presently, we can't ship dairy products into many international countries, and the ONLY items we can ship ship are non-food items (travel mugs, french presses, teapots, etc.) If you're interested in shipping international items, please contact us at Shipping@CoffeeCakes.com and we'll do our best to accomodate your request! We want to hear from you. Always select PO Box (USPS Post Office Box) when shipping to a P.O. Box. We are unable to track orders shipped to P.O. Boxes with a tracking number. Under normal circumstances orders leave CoffeeCakes.com two business days after the order is received. Orders placed Thursday, Friday, Saturday and Sunday leave CoffeeCakes.com the following Monday (as long as Monday isn't a shipping Holiday). At checkout, you can specify your ship date for any date in the future, which means no more last-minute rushing for gifts! Order now, and we'll ship your gifts in time for your special occasion. Order birthday gifts, anniversary gifts, holiday gifts early and feel comfortable knowing that they'll be shipped when you want them shipped. PLEASE NOTE: During the month of December, due to the extended shipping times for all shippers, we reserve the right to ship your order out earlier than your future ship date requested to ensure your gift arrives in time for Christmas. Please note: Due to increased security measures designed to protect our customers, not providing accurate billing information WILL delay your order. When ordering, please be sure to provide accurate billing information. Please note: We reserve the right to refuse service to anyone. Since we rely on third-party shipping companies to get your order to you, once your order leaves CoffeeCakes.com, it's out of our control. CoffeeCakes.com is unable to control our shippers and/or offer any shipping or delivery guarantees. We can only tell you when you can expect your order to arrive based on the estimates and information we receive from our shippers. CoffeeCakes.com cannot give any delivery or service guarantees. We reserve the right to substitute an item of equal or greater value if necessary. If, after taking your order, an item becomes unavailable, we may substitute an item of equal or greater value. If we're unable to ship your package within our published freight rates, we reserve the right to assess a "special packaging charge". Customers will be notified IN ADVANCE before any special packaging charges are applied, and given the decision to accept the additional charge or not. This charge is only put in place when the cost to ship a package far exceeds the cost paid by the customer. This allows us to keep our shipping and handling rates low, and to split the cost of the shipping and handling charges for the select few packages that may fall outside our standard shipping and handling charges. Please check all of your addresses carefully. We can only guarantee delivery to addresses we're given. Additional fees will be charged to redirect packages when incomplete or incorrect information is given. A customer may cancel an order at anytime. If the order has already been shipped, the customer will be responsible for paying a $10 order intercept fee or the freight charges to have the order returned to us, whichever is greater. It's best to cancel an order before it's shipped in order to avoid incurring any additional fees. Customers shouldn't refuse a package unless they're willing to pay all shipping charges, to and from the customer. If a package is refused by a customer, the customer will be responsible for all shipping charges, to the customer and back to CoffeeCakes.com. To cover the extra handling costs of taking returned items back into inventory, CoffeeCakes.com charges a 20% restocking fee for returned items that are not damaged, defective or materially different. Register to have One-Click-Ordering and Send to Multiple Addresses! Register now and sign into our store! Registering allows you to sign into your CoffeeCakes.com account and enjoy a faster, more personalized and efficient checkout experience; stored shipping and billing addresses are pre-populated on your checkout pages, which allows you to send orders to multiple recipients and addresses, without having to re-enter your data multiple times! To register, simply click the "Register" link in the upper left corner of our website (in white on the red bar at the top). Once you register, you'll be able to access previous order information, order history, shipping status and tracking number(s) by simply signing into your account; it also allows you to re-order items with just one click! We Pass our Discounted Freight Rates Along to You! We make every effort to charge the actual shipping rates we're charged. We don't mark up our shipping rates. Because we've been in business for many years, we're able to benefit from significant negotiated discounts, which allows us to pass the savings along to you!